President Tran Dai Quang and President Donald Trump witnessed the signing of co-operation agreements worth a total of US$12 billion, mostly in aviation, petroleum and seaports between Vietnam and the US after their talks in Hanoi on Sunday. The national carrier Vietnam Airlines and American aerospace manufacturer Pratt & Whitney signed a $1.5 billion contract of the selection of aircraft engines and support services for 20 Airbus A321NEO aircraft. The two parties also signed a memorandum of understanding on maintenance contracts covering these engines. The deal between Vietnam Airlines and Pratt & Whitney includes 44 Pure Power Geared Turbofan (GTF) engines in accordance with comprehensive terms of warranty, maintenance and repair of engines. President and CEO of Vietnam Airlines Duong Tri Thanh said the signing ceremony marked a new step in the development of Vietnam Airlines’ A321 fleet. Thành said the engine the firm chose was highly fuel efficient and especially environmentally friendly, and comes with comprehensive repair arrangements which help the firm to increase operational efficiency and save on operating expenses. “I believe that the agreement between Vietnam Airlines and Pratt & Whitney will further reinforce the important economic, trade and investment partnership between Vietnam and the US,” said Thanh. Speaking at the ceremony, senior vice president of sales, marketing and customer support at Pratt & Whitney, Rick Deurloo, said he was proud to celebrate this momentous occasion with Vietnam Airlines. "We’ve been powering Vietnam Airlines since the early 1990s when the airline received its first PW4000-powered 767. We look forward to continuing our strong relationship and long history with Vietnam Airlines,” said Deurloo. Since its first operation in 2016, the GTF engine has shown strong performance with a reduction of 16 per cent in fuel consumption, 50 per cent in emissions and 75 percent noise compared with the current engine. Vietnam Airlines’ A321 airplanes equipped by GTF engines are the new version of the A321 - the largest aircraft type in the Airbus A320 family. The A321NEO will provide passengers with new standards that will optimise cabin space, increase the size of the exits and new design of passenger cabins. Vietnam Airlines expects to receive 20 A321NEOs in 2018 and 2019. Pratt & Whitney, a subsidiary of United Technologies Corp USA established in 1925, is a global aerospace leader in the design, manufacture and services of aircraft engines and auxiliary power units. Today, Pratt & Whitney’s large commercial engines are being used by 25 percent of the world’s aircraft. Pratt & Whitney’s maintenance, repair and overhaul services are carried out on a global basis. On the same day, Vietjet and Pratt &Whitney also announced the selection of the GTF engine to power the budget airline’s order of 10 new aircraft. This deal, which is valued at $600 million at list prices, includes a 12-year EngineWise™ Fleet Management Program for Vietjet’s 10 new-age aircraft. “We are delighted to add 10 additional GTF-powered aircraft to our fleet. We look forward to the proven performance and environmental benefits that they deliver,” Dinh Viet Phuong, Vietjet’s vice president said. The PetroVietnam Gas Joint Stock Corporation (PV Gas) struck a MoU on the Son My natural liquefied petroleum gas warehouse with the AES Group Ltd. with a total value of $1.3 billion, and another MoU on co-operation with the Alaska Gasline Development Corporation in natural liquefied petroleum gas provision and upstream investment. Meanwhile, Hoang Huy and Navistar groups inked a MoU on trade of trucks. 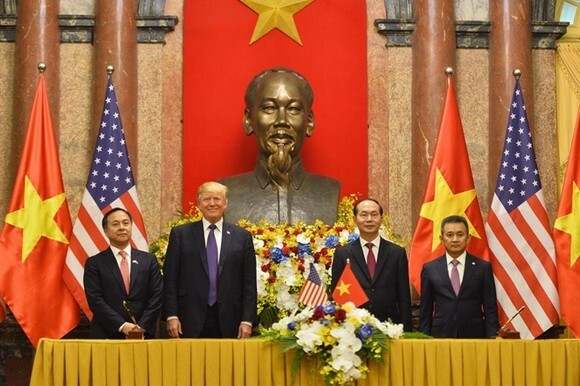 Trump’s first visit to Vietnam, which ended on Sunday, was taking place at a time when the Vietnam-US comprehensive partnership is progressing, especially after the US visit by Prime Minister Nguyen Xuan Phuc in May 2017. Vietnam and the US established diplomatic ties on July 12, 1995. Positive strides have been recorded in bilateral relations in all spheres since the countries established a comprehensive partnership in July 2013 on the basis of respecting each other’s territorial integrity, political regime and development path, for the sake of their own interests and for regional peace, stability and development co-operation. Since 2005, the US has become one of the leading trade partners of Vietnam, with two-way trade rising 20 percent in recent years.